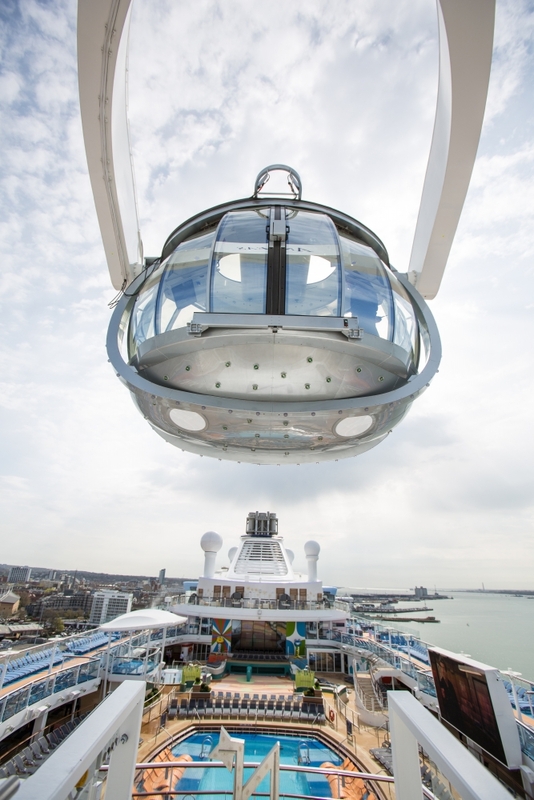 A trip on the brand new Anthem of The Seas cruise ship is anything but ‘plain’. It’s cruising at its most technologically advanced, stylish, fun-packed and family-friendly and journalist Kim Jones and her family were one of the first onboard. 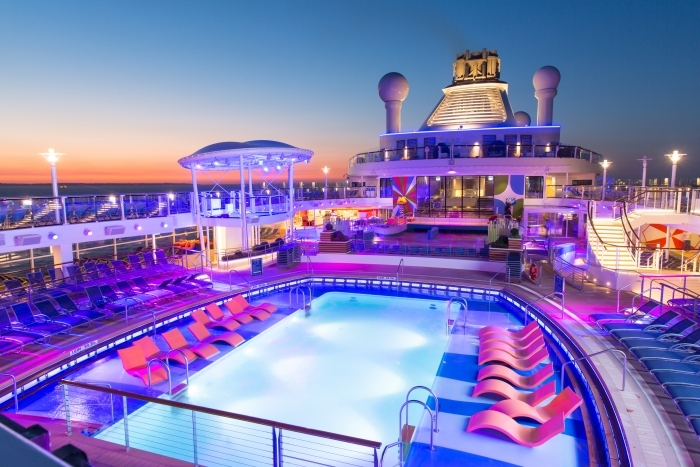 The amazing cruiseliner, part of Royal Caribbean’s fleet, is harboured in Southampton for one season only this summer, making it perfectly placed for easy-to-hop-on cruises to the Mediterranean and Canaries. Catch it quickly, because on 27 October it leaves our shores for Cape Liberty Cruise Port, New Jersey and its Caribbean adventures. This ship boasts more state of the art technology, world-class restaurants and entertainment than any other liner out there and we were lucky enough to be amongst the first passengers to sample the new mammoth ship (the third largest cruiseliner in the world) on a pre-inaugural two-night sailing from Southampton around UK waters. Whilst we knew we were going to be wowed by its sheer size, it wasn’t until we got our first glimpse of the ship in its docking bay that we could really appreciate its splendour. With a staggering 18 decks, it towers over port buildings and dwarfs all other ships looking up to it. 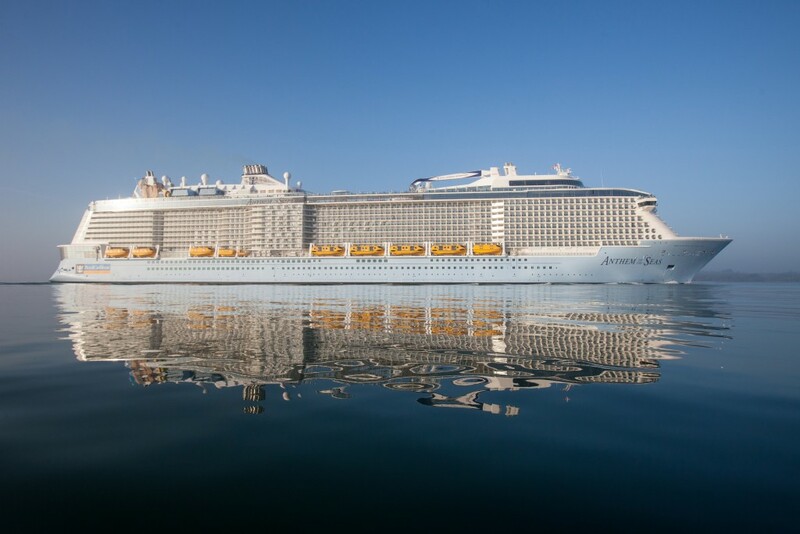 At 1,141 foot long and with 2090 staterooms (space for 4,905 guests) it was an awe-inspiring feat of engineering. Not a little mind-blowing, too. Like, how does this thing float? And just how big an engine does it need to get going? What awaited us onboard was gloriously impressive. As we embarked we were ensconced by a five-star hotel vibe – think smiling staff, twinkling chandeliers, glass fronted lifts rising and falling over numerous floors and the sound of music and excited chatter all around. Our lovely adjoining staterooms looked out onto private balconies and were equipped with large tvs offering countless movies. But there was no time to lounge about watching the telly when we had deck after deck of ship to explore. cabins offer comfortable luxury – and what views! Eight themed bars and lounges waited to welcome us with drinks. And there’s a different experience to be had in all. How does a cocktail in the Latin-inspired Salsa bar Boleros, or wines from around the world at Vintages sound? Or maybe you’re more in the mood for an ice-cold beer at one of the pool bars? Of course you are. There are also 19 restaurants and cafes onboard offering anything from buffets to gourmet grab’n’ go sandwiches for lunch and dress-up-to-the-nines haute cuisine for dinner as well as famous favourites Jamie’s Italian and Johnny Rockets. We dined at Jamie’s and Chic (serving contemporary cuisine) and were wowed not only by the dishes, but by the attentive and friendly service by our waiters. Royal Caribbean are constantly striving to bring new technology onboard and to come up with ‘experiences at sea’ you can’t get on any other cruise liner. Step up the amazing North Star – a London-Eye type viewing capsule that rises to 300 feet above sea level to provide a bird’s eye view of the ship and the ocean around. Then there’s the Bionic Bar. Place your cocktail order via one of the ipads at the bar (kids can mix up their own non-alcoholic drinks too) and watch the adorable ‘robot bartenders’ hit the optics, and shake up your chosen concoction. bumper cars on board – a world first! Anthem also offers the taste of an ‘adventure holiday’ afloat. We enjoyed throwing some spray at the surf machine FlowRider, scaling the heights of a climbing wall (don’t look down because the sea looks a long way away!) and skydiving in a vertical wind tunnel in Ripcord by iFLY. My sons also spent a lot of time in The SeaPlex Indoor Sports zone which features the usual table tennis, football and ice-hockey tables, but also houses a full-size basketball court, which ingeniously transforms into a roller-skating disco in the evening (complete with suspended, ‘floating’ DJ booth) and – a first at sea – a dodgem rink. It also reinvents itself into ‘circus school’ at various times during a sailing where you can learn to trapeze at a great height. I was lucky enough to bliss-out in the ship’s spa with an Elemis Hot Stones massage (one of the first times I almost fell asleep during a treatment) and we all enjoyed partying to the musical We Will Rock You. Set aside your preconceptions about cruise ship entertainment if you have any – the standard of the stage production and cast was just as good as anything you’ll see in the West End. We crammed so much into our cruising weekend and loved every moment. The boys hadn’t even bothered with the Xbox area. There was simply so much else to be wowed by.